Now this is the commandment--the statutes and the ordinances--that the LORD your God charged me to teach you to observe in the land that you are about to cross into and occupy, 2 so that you and your children and your children's children may fear the LORD your God all the days of your life, and keep all his decrees and his commandments that I am commanding you, so that your days may be long. 3 Hear therefore, O Israel, and observe them diligently, so that it may go well with you, and so that you may multiply greatly in a land flowing with milk and honey, as the LORD, the God of your ancestors, has promised you. 4 Hear, O Israel: The LORD is our God, the LORD alone. 5 You shall love the LORD your God with all your heart, and with all your soul, and with all your might. 6 Keep these words that I am commanding you today in your heart. 7 Recite them to your children and talk about them when you are at home and when you are away, when you lie down and when you rise. 8 Bind them as a sign on your hand, fix them as an emblem on your forehead, 9 and write them on the door posts of your house and on your gates. This is a very important passage in Judaism, called the "Shema" (verses 4-9), and is a key exposition on the 1st commandment (and/or 2nd commandment depending on how you number them). It is also distinguished by verse 5, "You shall love the LORD your God with all your heart, and with all your soul, and with all your might" as a very important interpretation, centuries later referred to by Jesus as greatest of all the commandments. The idea of loving God so passionately as a positive motivator to keep the law stands in welcome contrast to doing so out of fear, obligation or even awe. 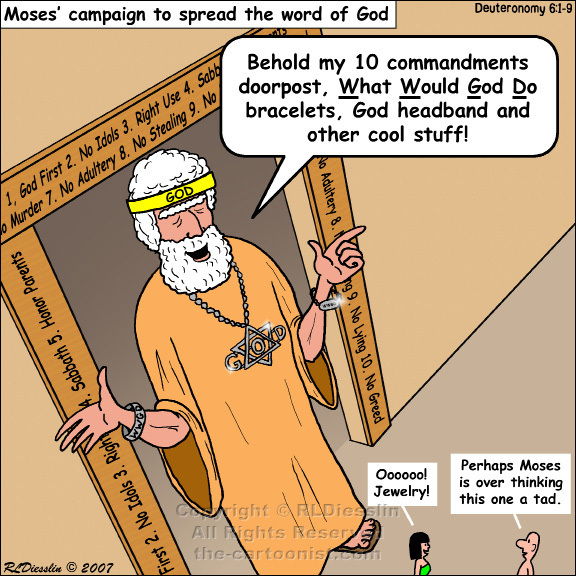 The cartoon has some fun with Moses as if he were merchandising scripture on doorposts, jewelry and headbands, but unlike the cartoon cool stuff sold at www.the-cartoonist.com web site, (What! Another shameless plug!) it was used as a teaching tool. It became a tradition and is still done to this day. Note: the giving of the Ten Commandments is recorded in Deuteronomy Chapter 5, just before this passage, and also in Exodus Chapter 20. A good homework exercise would be to compare the two versions side-by-side. There may be a test.